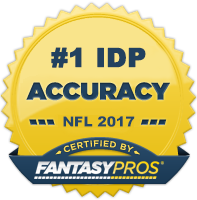 Hello and welcome to my 1st article with IDPGuru.com. In this article, I will be covering the top 10 defensive steals of the 2012 NFL Draft. Let's get started. In 2011, Upshaw was one of, if not the best player on the nation’s top collegiate defense at Alabama. When the Ravens took him with the third pick in the second round, they brought Upshaw into one of the best “play immediately” situations available. Baltimore lost OLB Jarret Johnson to free agency, and suffered a huge blow when Terrell Suggs went down with a potentially season-ending Achilles injury. These losses will allow Upshaw to see plenty of time in his first year with the Ravens. He is in the right situation, he should have the playing time, and he has an incredible physical and mental skill set. *On a fantasy note, league management systems such as MFL currently have Upshaw classified as a DL. With this said, he deserves consideration as a late round DL3 flier in deeper leagues. Every year the NFL Rookie Draft offers a handful of standout football playmakers. The Rams added one from this year’s class with the seventh pick in the second round: Janoris Jenkins. Jenkins is bar-none the quickest, most agile cornerback coming to the NFL this year. Though he could afford to add some size, his athleticism allows him to go stride for stride with just about any receiver in the NFL. Couple his cover skills with a senior season at North Alabama that saw him return three punts for touchdowns, and you have yourself a player that can contribute to your team in a variety of ways. Jenkins joins a defense that forced just slightly above one turnover per game in 2011. St. Louis needs him to make plays in their defensive backfield, so look for him to see the field early and often in 2012. The Philadelphia Eagles spent their fourth round draft pick on one the better athletes in the 2012 Rookie Draft in Brandon Boykin. They got great value in a productive player who played in a highly competitive conference. The Devin Hester of this year’s draft class, Boykin returned four kicks and one punt for points in 2011, while amassing nearly 2,900 total return yards. This was all in 14 games. Although he likely won't see a ton of playing time on defense this season outside of defensive subpackages, he should quickly step in as the return man in Philly, as the Eagles want to avoid placing the frail DeSean Jackson in a special teams role again this year. Philadelphia did a fantastic job of finding value on the defensive side of the ball in this draft. They began by taking defensive tackle Fletcher Cox in the first round and then followed up with another fantastic pick in Mychal Kendricks in the 2nd round. With Kendricks, Cal’s top 2011 defender, the Eagles add a tenacious tackling machine to a linebacker corps plagued by injury and uncertainty in 2011. Kendricks was a hugely productive defender in his senior season at Cal, collecting 107 tackles in 13 games in 2011. He may not have the height or leaping ability to make highlight reel plays, but he's one of the most aggressive downhill run-defenders to come out of this draft and has the all around skills and development to be an every down player for the Eagles from Week 1. Lavonte David joins a Buccaneer defensive unit for which two of the top three tacklers in 2011 were DBs. Tampa had to address the linebacker position in the draft, and they did it by adding Nebraska’s David with the 26th pick in the second round. David, like Kendricks, is a blue-collar worker on defense. In two seasons with the Cornhuskers, he collected 156 tackles, 16.5 TFL, and 6 sacks, while not missing a game. He is a sound tackler, has great play recognition, and possess above average sideline-to-sideline speed. Anytime you get an every down linebacker known for his tackling ability in the late second round, you can consider it an steal. David is no exception. Look for 75-95 tackles and a sack or two from this rookie in 2012. It's amazing how different a defensive unit can look after the departure of one player in the off-season. The Texans were outbid by the Buffalo Bills for Mario Williams’ services in 2012, instantly turning the defensive front seven from a team strength, to somewhat of a team question mark. The Texans selected Illinois defensive end Whitney Mercilus in the first round of April’s Draft to be Williams’ heir apparent. However, Crick could prove to be just as vital to the Texans defense as Mercilus, and he was taken exactly 100 picks later. Crick provides good size for a defensive end—so good that you may see him move inside on third down pass rush situations. He was productive at Nebraska during his Sophomore and Junior seasons, recording 70+ tackles each year while alternating between the DE and DT positions. There are some durability concerns after his senior season was cut short by knee and chest injuries, however. From the 2010 to the 2011 season, the Green Bay Packers suffered one of the worst year-to-year downfalls in production from a defensive line unit in recent memory. Outside of Clay Matthews—and even he had a down year—the Packers could not get to the quarterback. With their first of two picks in the second round, the Packers selected a first round talent in Michigan St.’s Jerel Worthy. The 309lb Worthy played defensive tackle for the Spartans, but will likely move to the end position with B.J. Raji cemented in the middle of the Packers 3-4 defensive line. At defensive end, Worthy is an immediate matchup nightmare, with his massive size and above average athleticism. Opposing tackles will have to choose between sliding to block the rushing outside linebacker, while leaving their guard alone to block Worthy, or assisting on Worthy and letting a back try to stop the outside pressure. The situation is ideal for Worthy, who should make quick work of one-on-one matchups with guards. He also will not be asked to play every down, which should resolve questions about his fitness/desire—the only real knock on him going into the draft. Most NFL Draft Analysts look to later rounds to identify the steals of the draft, but the San Diego Chargers have a case for having one of the bigger steals in 2012, and it happened in the first round. San Diego spent the 18th overall pick on South Carolina’s star defenseman, Melvin Ingram. Ingram’s smaller frame allowed him to drop much further than many expected—he is a shade under 6’2”, with short arms, and small hands. Though this is not the ideal profile for an NFL defensive end, he will join the Chargers as a starting outside linebacker. Ingram was perhaps the most versatile defensive player to come out of this year's draft. Expect the Chargers to move him around all over the field in a fashion similar to Terrell Suggs/Chris Clemons. The Lions found themselves picking in the fourth round of the 2012 Draft with a huge name still on the board: Oklahoma outside linebacker Ronnell Lewis. Although improving their front seven wasn't a significant off-season goal for the Lions, they had no choice but to take the best player available, and add some great depth to their improving defense. Lewis was one of the more sound tacklers at his position in this year’s draft and is nice a fit for the Lions "Wide 9" scheme. Although most draftniks pegged him as a 3-4 OLB, the Lions will use him at defensive end. Kyle Vanden Bosch is in the twilight of his career and Cliff Avril is currently playing under the franchise tag and may not return next season. If Lewis can improve on his work ethic and develop a better arsenal of counter moves, he has a chance to be a 7-8 sack type of guy for the Lions. Expect him to get a relatively decent amount of snaps this season as the Lions heavily rotate their front four. Robinson is, above all else, a phenomenal athlete and speedster. He clocked an official 40-time of 4.33 seconds at the NFL combine, and logged excellent quickness numbers in the short-shuttle and cone drills. His athleticism vaults him into steal territory for the Vikings this upcoming season. Robinson joins a Minnesota team that was in desperate need of getting younger and deeper at the DB position. Their only impact player at cornerback is 34 year old Antoine Winfield, and he is getting any younger. Robinson should see some snaps at corner, most likely on passing downs as a nickel or dime package guy. The kicker here is that the Vikings have to be looking to relieve Percy Harvin, maybe the best player on their roster, from his taxing return duties. Robinson was the fastest, quickest, most dynamic athlete the Vikings added during the draft, and he could take over return duties as early as Week 1. Expect Robison to contribute on special teams and in subpackages immediately for the Vikings. If you have any questions for Ryne, feel free to email him at rynemisso@idpguru.com or @rmisso23. Also, feel free to post any questions or comments for Ryne in the comments section of this post.